The latest flagship duo from Samsung- The Samsung Galaxy S8 & S8 Plus has already been officially unboxed in NYC on 29th March. With all the stunning specs and features, the device is truly a flagship killer of 2017. Moreover, the Galaxy S8 is available for pre-orders at the US carriers and Samsung’s official website, but the shipping is expected to start from 21st April. If you are an avid reader of AndroidSage, you might be knowing that we are continuously coming up with the official S8 features for you guys. As of now, we have already posted on the Galaxy S8/S8 Plus Infinity stock wallpapers, Stock Apps, Virtual assistant Bixby, Galaxy S8 Launcher and much more to follow. Meanwhile, Galaxy S8 is the first device to come up with the rounded Google search widget. The weather app & clock widget is also as stunning. So, if you’re already a fan of it and want the same on your android phone, there is a good news for you. We have got a hold on the Stock weather app and Clock widget from Galaxy S8. You can grab it from the downloads section below. Basically, there are two methods to get the Weather widget and Clock widget on your device. The first method is by installing the Stock Weather widget on your device. But is is important to note the Stock widget can only be installed on the Samsung devices. So, it is recommended only Samsung users should follow the method 1. Rest of the users can follow the alternative method 2. If you have a Samsung device running Android 7.0 Nougat and later, you can follow this method. As the System dump for Galaxy S8 is now available, we have extracted the Stock Weather widget from the same. The Weather widget comes as an APK file and you can simply download and install it on your phone. Furthermore, you just need to go into the widgets section and drag the particular widget on your home screen. The file weighs around 5.78MB, you can grab the links in the downloads section given below. The file given below is an apk file, it can be directly installed on your Samsung device. Even though the above mentioned Stock Weather widget is only for the Samsung devices, following this workaround will let you get the same on your device. This method does not require root, so just follow each and every step as given below. 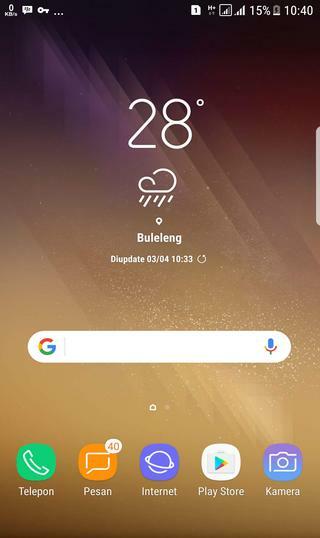 How to get the Galaxy S8 weather & clock widget using Xwidget app? One you are installing the Xwidget app, simply open it and follow the given steps. From the Online Tab, tap on the Galaxy S8 Weather Widget and download it. From the Online Tab, tap on the Galaxy S8 Clock Widget and download it. Now, once you are done with the downloading part, follow the quick steps to set the same. You will be asked to choose the widget from the list, Simply select the downloaded Galaxy S8 widgets. Once you choose those, it will appear on your Home screen. So, this is how you can get the Galaxy S8 widgets on any Android device. Did you like it? Give it a try and share your experience with us. Well, if you face any issues, let us know in the comments section below.